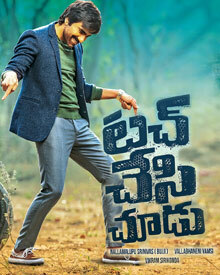 Touch Chesi Chudu is action comedy Indian telugu film. It was released in 2018. Ravi Teja, Raashi Khanna, Seerat Kapoor played lead roles. Freddy Daruwala, Murali Sharma, Satyam Rajesh played supporting roles. It was directed by Vikram Sirikonda and produced by Nallamalupu Bujji. Music composed by JAM8.